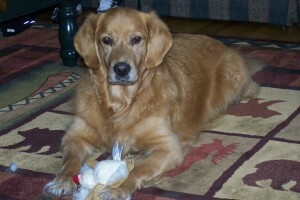 On July 29 our beautiful Sophie left us to go to the Rainbow Bridge. She was the most well behaved, loving, beautiful friend. We had only a short 7 years with her when she was diagnosed with Stomach Cancer. We brought her to our veterinarian when she stopped finishing all of her dinner and breakfast (VERY unusual for her) and she developed diarrhea. Every test possible was given and came out negative, and I was thinking, boy when we get through whatever this is at least we know she is very healthy….. until the final invasive test that determined Adenocarcinoma. It is amazing to hear her story before she came to us. She was dropped off at a shelter, saved by GRROWLS, fostered, adopted, returned, fostered, to the point where there was a real hesitation for someone to foster her again. I like to think she was just waiting for us! She in no way resembled the dog we heard stories about. She was the best dog we have ever had, she was so gentle and so well behaved. She was the “model child” of our neighborhood, as my neighbors called her. When all the neighbors got together to walk their dogs, she stayed right by my side. Everyone that knew her said she was the most well behaved , gentle, beautiful dog they had ever known. We miss her every day, she had her specific routine, which we revolved our lives around. It is so hard to walk into an empty house without her there to greet us, or sit on the couch without her next to us cuddling, or wake up without her lying next to us in bed staring at us with her big beautiful brown eyes. I would swear she must have been a show dog the way she trotted so beautifully and would walk with me off leash and never leave my side. We are so glad our boys were able to leave college to get home and say goodbye to their sister and best friend. It seemed she understood everything we said to her, and I pray she heard and understood us tell her how very much we loved her. Her final weekend we took her to our vacation home that she loved so much. Whenever we would be packing up to leave she would stand in the doorway as if to say “I don’t want to leave yet”. We took her to her favorite beach where she laid on the sand just looking out into the water – as if she knew. All of our neighbors, our friends and the boy friends stopped in to say goodbye to our beautiful Sophie, I hope she felt all the love from so many people who knew her. I take some comfort in the fact that we saved her and she had a wonderful loving life with us, but it is heartbreaking that our best friends leave us way too soon.